Building an EVO X to make more power? Already making more power and your coolant overflow tank is filling up for no good reason? The factory head bolts can begin to stretch with higher cylinder pressures and cause a enough space between the block and head for combustion to leak out. Not only are you losing power, you are putting your cooling system and head gasket at risk. 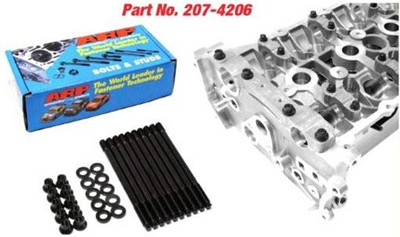 Replacing the stock head bolts with ARP head studs creates a super-strong connection between the head and the block and will ensure a positive seal of the head gasket. Using ARP studs not only makes a much more solid connection, they facilitate easier R&R of the head and can be torqued more accurately. Since no torsional torque is required turn the entire shaft (as with bolts), there is an extremely reduced risk of variation in torque from one stud to the next, which is much better for the aluminum head.